Yesterday we arrived in Shaba National Reserve just past nightfall. I always enjoy arriving at a place at night. You hear sounds around you – maybe a river running, palm fronds in the wind. The next morning you get to step out of your room to find what was behind the darkness the night before. My first sight this morning was the Ewaso Nyiro river only a few steps from my room. Today I leave Nairobi and head to Samburu Heartland. I was seized by a shock of anxiety when I looked at my gear: laptop, camcorder and mic, SLR camera with an assortment of lenses, tripod, my clothes and boots, binoculars, field guides, GPS unit, and of course the small arsenal of cables, batteries and blank tapes. I hate not traveling lightly, but this small roving media center is critical to the success of my story-telling mission. I've been in Nairobi for a few days, settling in and preparing for my travels ahead. I was in Nairobi for most of 2004, and it's great to reconnect with the staff in our headquarters here. I've been welcomed so warmly that in some ways I feel like I've come home from a long trip. 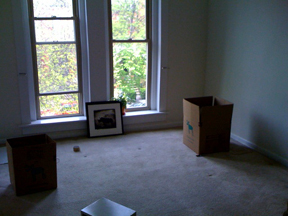 It's come down to this: an empty apartment and a duffel bag ready to go. As was said in my previous blog, I had to visit the Kgalagadi Cheetah Project in the Kgalagadi Transfrontier Park during 02/03/08 till 07/03/08. The main aim of the visit was to spend time, learn, and discuss the proposed leopard research with Gus Mills, one of the leading figures in the field of large carnivore ecology in Africa.